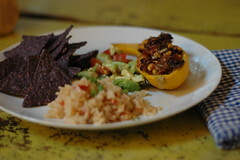 Tex-mex stuffed yellow squash with fast and easy sides was on the menu last night. I needed to use our CSA produce and had some grass-fed ground beef in the freezer that I needed to use. I don't like beef much, I don't like ground beef at all, but the boys do and since they aren't crazy about yellow squash, I thought it would be a good compromise. In 2007 Everyday Food had a "in season" article about yellow squash that I bookmarked for the day that we had some that needed to be used. There were everal recipes, but this seemed the most kid-friendly. Preheat oven to 400. Split lengthwise and hollow out 2 large yellow squash. Be sure to cut off a small slice on the bottom so it will stand up on its own. Leave at least 1/4" shell. Season with salt and pepper. Chop reserved insides of the squash and cook in a skillet with chopped bell pepper, chopped onion (I used green onion and a clove of garlic), tomato paste, and chili powder. Cook the vegetables until barely soft. Add ground beef and cook until no longer pink (maybe 10 minutes, total.) Once cooked, add 1 cup (more or less) frozen corn kernels. I didn't have any, but I did have a random can of cream-style corn (don't know why, because that is my least favorite style of corn) that I rinsed off and added. Mix in 1/4 c cojita cheese (the EDF recipe said parmesan, but I thought mexican would be better). Season to taste with salt and pepper. Fill shells and bake, covered, about 30 minutes. Uncover, sprinkle more cheese over the top, and bake another 10 minutes. cook 1/2 c brown rice with 1 c water, salt, and 1 T salsa. Done. My boys don't like brown rice so much, but the salsa disguises the color and flavor. Also, that's all I make, so they don't have much of a choice. Fast guac- 1 chopped avocado, 1 chopped plum tomato, juice of half a lime. Serve with blue corn chips. There were about 2 cups of the squash beef mixture leftover. I stashed it in the freezer to use for enchiladas or beef taco soup later this fall. Despite little boy's misgivings upon looking at the dish, he ate it all up, even the squash shell (once I cut it up and mixed it all up with the rice). Gary ate it all happily. I thought it was pretty good and not too meaty (I was a vegetarian from 1994-2001 when I gave up 100% vegetarian food- with exceptions for good bbq, because I'm a Memphian, after all- for happier suppers for Gary. The things you do for love!). There was one squash half and some rice left over, so I'm going to reprise this dish as a soup for my lunch today. I'm not sure if I'll make this again, but I was pleased with how it turned out. More kids cooking next week. . . .